Provide comfort for the family of Auwilda Funderburk with a meaningful gesture of sympathy. A celebration of life for Auwilda Funderburk, 90, of Ardmore formerly of Medford, will be 2:00p.m., Monday, April 8, 2019 at First Baptist Church, Medford officiated by Joseph Funderburk. Burial will follow in Rosemound Cemetery. Auwilda Imogene Funderburk was born March 27, 1929 to Lewis and Mabel Green in Weedpatch, California and passed away April 5, 2019 in Ardmore, Oklahoma. She graduated from Norman High School 1947 and attended the Draughon’s School of Business. On October 1, 1949 she married the love of her life, Donald Dean Funderburk and together they had four children. In 1961 they moved to Medford and went into business with her brother, Marvin Green. Auwilda and Don opened Don’s Distributing Company LTD in 1965 until 2009. In 2014 she moved to Ardmore to be closer to her family. Auwilda is survived by her daughters; Rebecca Damm and husband Lee of Duncan, OK., Donita Hagerman and husband Jimmy of Ardmore, OK., Sharla Ramirez and husband John of San Antonio, TX. ; 8 grandchildren, Donald, Jack, Joe, Katie, Paige, Sarah, Jarrod, and Jonathan; and fourteen great-grandchildren, Nick, Zach, Alyssa, Samantha, Luke, Jackson, Laura, Maxwell, Jackie, Corbin, Isaac , Sophie, Presley, and Giselle. She is preceded in death by her husband of 36 years, Donald Funderburk; son, Philip Funderburk; parents, Lewis and Mabel Green; sister, Verna Heneger; Brother, Marvin Green. Memorial contributions can be made to the Southern Baptist International Mission Board with Ladusau-Evans Funeral Home serving as custodian of the funds. 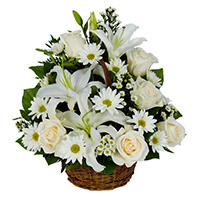 Condolences may be made and services viewed at www.ladusauevans.com . 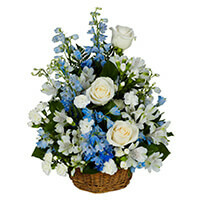 To send flowers in memory of Auwilda Imogene Funderburk (Green), please visit our Heartfelt Sympathies Store. We encourage you to share your most beloved memories of Auwilda here, so that the family and other loved ones can always see it. You can upload cherished photographs, or share your favorite stories, and can even comment on those shared by others. Jim and Patti Drennan AND Dwight and Mary Dickey and The Schneiders and The Chapmans have sent flowers to the family of Auwilda Imogene Funderburk (Green). Our thoughts and prayers to your families at the loss of Mrs. Funderburk. Brings back good memories of years ago, my brother Dennis working for Don's Distributing delivering merchandise in Oklahoma, Kansas. And I occasionally helped. A successful business venture for our community. Praying for you in your grief. Mrs. Funderburk was a wonderful lady who touched many lives. Jim and Patti Drennan AND Dwight and Mary Dickey purchased the PEACEFUL WISHES BASKET for the family of Auwilda Funderburk. We are extending our deepest sympathy to all during this difficult time. Auwilda lives in our cherished memories. The Schneiders and The Chapmans purchased the THINKING OF YOU BASKET for the family of Auwilda Funderburk.